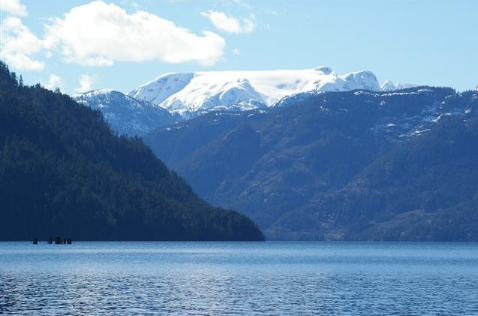 As a teenager growing up in the Comox Valley, Comox Lake was synonymous with lake parties and Lucky beer. However, it was also the setting for handfuls of childhood memories – everything from swimming to boating to picnics and “family fun time.” It is, in fact, an essential part of summertime for anyone who’s raised in the Valley. 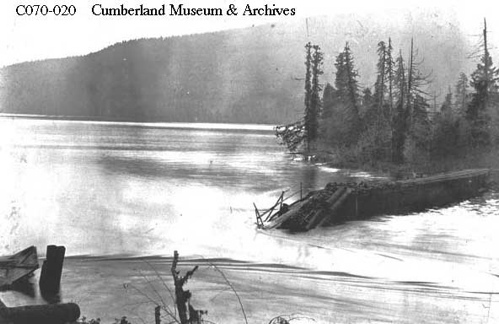 Cradling the hugely historical town of Cumberland, Comox Lake is a short 10-kilometre drive from downtown Courtenay. Fed with crispy cold glacier water, the body of water is both populated and isolated, depending on which end of the lake you happen to visit. The shores nearest Cumberland are clearly the most popular with Valley residents, while the northeastern shores are dotted with private residential cabins. Time has not changed the landscape of the lake very much. 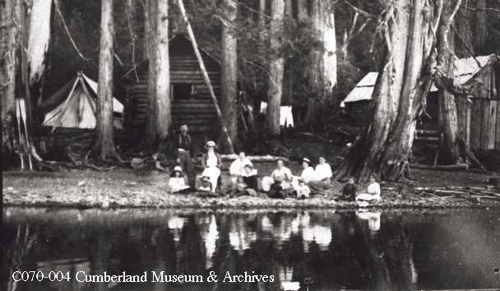 Mining in and around Cumberland was a booming industry in the early 1900s, but during the strike between 1912 and 1914, many displaced families built a temporary shantytown along the lake’s shore. Though unseen, the floor of the lake was completely shuffled due to an earthquake that shook the area 63 years minus a day ago on June 23, 1946. Perhaps the most famous – and most controversial – figure to come out of the mining era is Albert “Ginger” Goodwin [photo]. 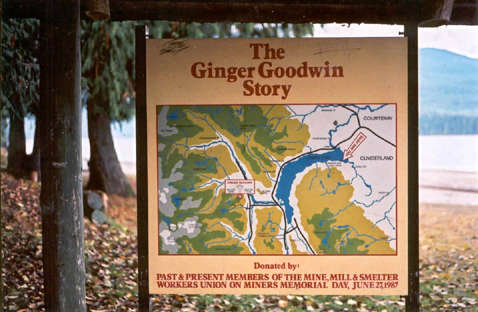 Ginger Goodwin, an English coal miner, was a steadfast champion of unionized labour and caused an uproar in the community when he dodged the draft in 1918. Ginger hid out in the mountains around Comox Lake and was secretly brought food and supplies by his supporters. Albert “Ginger” Goodwin was eventually found, shot and killed at the furthest end of Comox Lake in July of that summer. 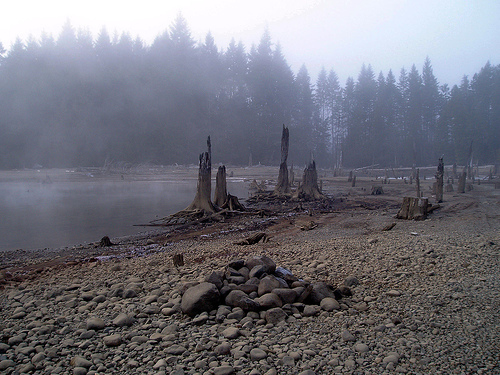 Between Ginger’s legend and the mysterious scenery that paints Comox Lake, I have always found the area to be hauntingly beautiful – emphasis on the haunting. 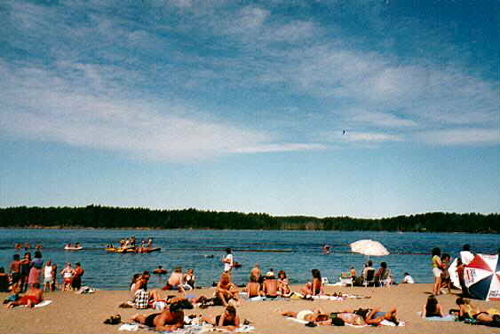 My last memory of Comox Lake was Father’s Day in 1998 as my family and I enjoyed a picnic in the warm early summer sun. The lake also boasts a boat launch, campground and RV park, a concession, children’s playground as well as countless hiking and mountain biking trails. 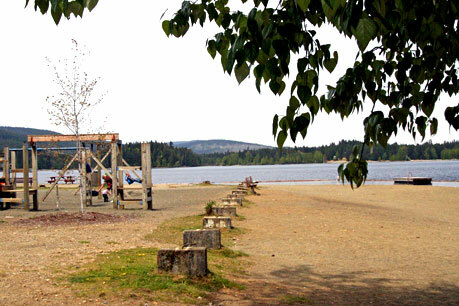 Public access to Comox Lake is primarily located near the campground and RV park at 1100 Comox Lake Road. While the lake is open year-round, the campground, picnic and playground areas are only maintained from May 1 to September 30. To book a campsite, please visit the campground’s website and for more tourism opportunities, visit the Comox Valley Chamber of Commerce. 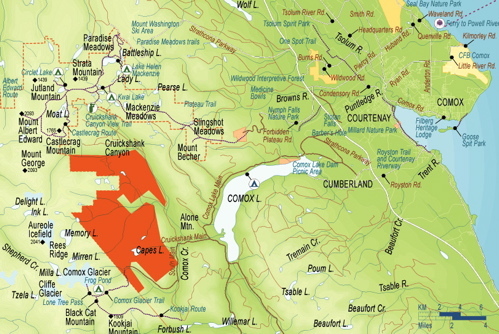 Your best bet for mountain biking experience and information is Cumberland’s Riding Fool Hostel. Beautiful lake and area…I always found the water too cold for swimming but you kids loved it! 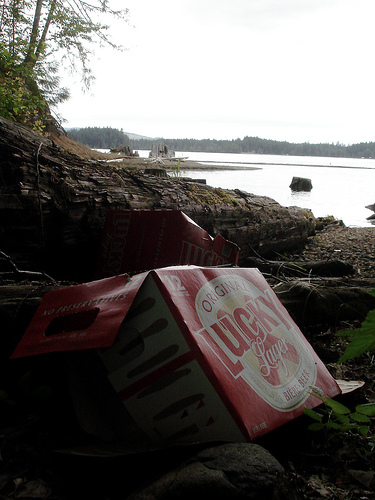 Great story and pics, I loved Lucky for a long time but recently discovered the unfortunate truth about “Vancouver Islands” Lucky Lager. This truth is the fact that Lucky is actually owned by Labatt Brewery’s, which is in turn owned by a Brazilian/Belgian multinational conglomerate called Ambev. Ambev took 950 million dollars from the Canadian economy and purchased Budweiser at the end of last year. Lucky is brewed by Labatt in Edmonton and sometimes at the Kokanee brewery in Creston (also owned by Ambev). It is so sad that just because they put the words “Vancouver Island” on the package that we Islanders, who are so trusting and loyal, actually believe a multinational corporations mistruth. As a true islander I try now to support local companies and with so many great local breweries actually located on the Island I can no longer support a company that takes my money and exports it to a foreign company..……that is cheap! That really is too bad about Lucky. I merely mentioned it because Lucky beer seems synonymous with parties at Comox Lake – at least when I was growing up it did. Robyn took me to Comox lake last year. It was pretty cold but it was a nice cold on a really hot summer day We stayed for a while and then raced back down to Naniamo to catch the ferry back home. For a full account of Ginger Goodwin’s life and death, see Fighting For Dignity: The Ginger Goodwin Story, available at Cumberland Museum. I was so happy to find your page and beautiful pictures. Thank you! 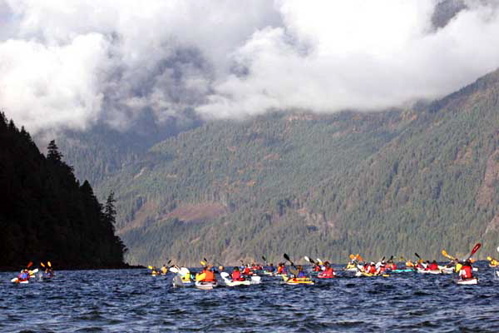 I’m hoping you can give me info about finding a place to stay next June when I bicycle from Denman Island around Lake Como down to Pt Alberni. 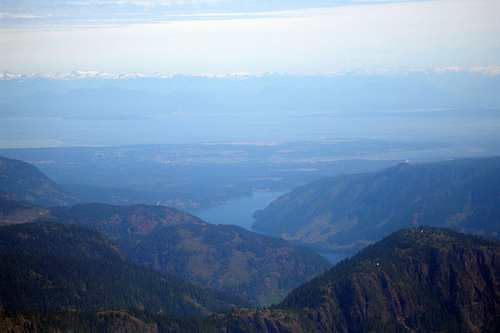 I’d like to stay at the very “bottom” of Lake Comox or down by Lake Elsie. Many internet searches produced nothing but your much-appreciated page. Sincere thanks. BW ps I’ll be biking with everything EXCEPT a tent!